Oftentimes, the less food I have in the house, the more creative I’m forced to be and the better my recipes turn out. Case in point, tonight’s dinner. I missed my weekly trip to the grocery store to stock up on fresh produce, so my veggie options were pretty slim. With frozen peas one of my few choices (and not one of my favorites), I needed a way to “hide” the peas in the meal. Pesto became the perfect solution. Add a spoonful or two to a piece of tilapia or even chicken, and you forget you’re eating something healthy. Enjoy! Pulse together all of the pesto ingredients in food processor until almost smooth. Set aside. Brush tilapia filets on both sides with 1 tablespoon of olive oil. Season with salt and pepper. In a large non-stick skillet, heat the butter and remaining teaspoon of olive oil over medium-high heat. Add the fish, and cook for about 4 minutes per side, until no longer translucent in the middle and lightly golden brown. Remove from heat, and squeeze fresh lemon juice over the fish. 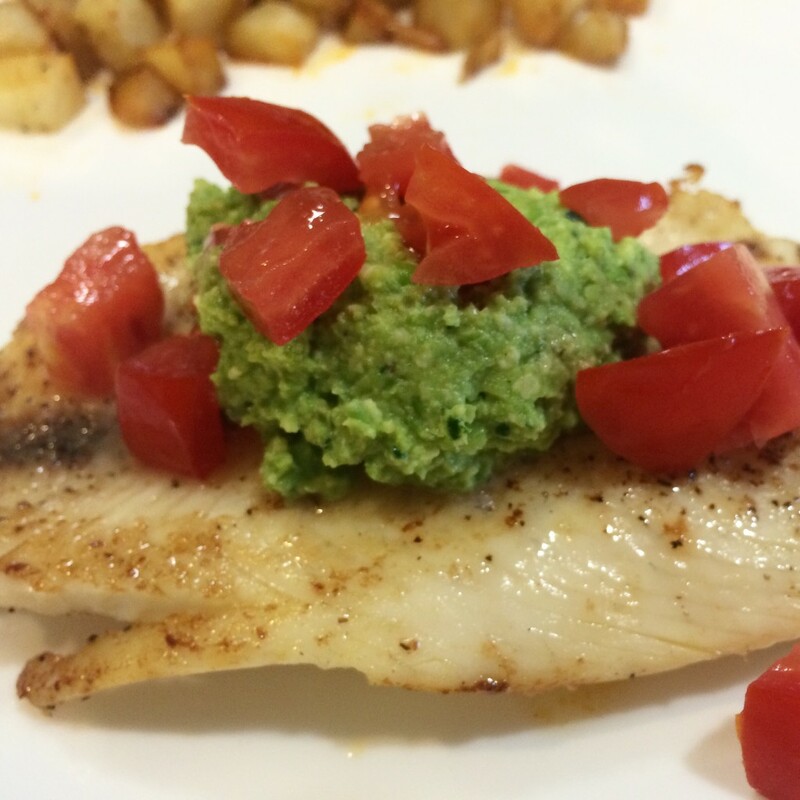 To serve, top fish with a spoonful of pesto and sprinkle with diced tomatoes.